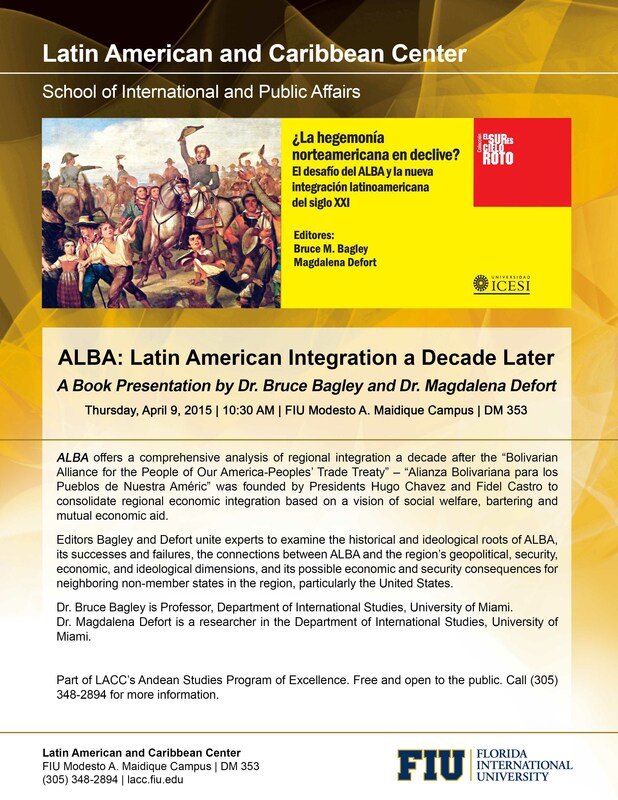 Professors Bruce Bagley and Magdalena Defort present their published works on ALBA (Alianza Bolivariana para los Pueblos de Nuestra América - Bolivarian Alliance for the Peoples of Our America) as the trade bloc celebrates its 10th year anniversary. Founded by Presidents Hugo Chavez and Fidel Castro in 2004, its 11 member-nations work to consolidate regional economic integration based on a vision of social welfare, bartering and mutual economic aid, as an alternative to U.S. sponsored Free Trade Zones. Bagley and Defort analyze trade trends and the changes brought on by ALBA over the past decade. Part of LACC’s Andean Program of Excellence.